Trad climbing evokes images of long-haired, van dwellers swapping leads up the sheer faces of Yosemite's El Cap. Grizzled free spirits scaling seemingly insurmountable walls with only tiny specks of metal held precariously in thin cracks preventing certain death. Trad climbing remains on of the truest ways to experience rock climbing and an essential skill for adventure climbers. It is challenging, committing and expensive to begin. Most climbers, particularly in Ontario begin top roping and bouldering indoors as Southern Ontario has one of the highest densities of indoor rock climbing gyms in the world. As skills progress sport climbing is the next evolution and bolted crags are quickly popping up on the outskirts of many major cities. But one of the truest ways to feel connected to the rocks is by placing your own traditional protection. Ontario rocks have their own unique characteristics requiring special protection. Our old grown Canadian shield and Niagara escarpment have given us an abundance of slabby, horizontal crack filled pitches and their occasionally crumbly faces make ensuring adequate safety somewhat more cerebral than other areas. Below I will outline the equipment requirements to ensure a fun day and how to build a trad rack for Ontario. This is the mainstay of your trad climbing rack. It is recommended that you become quite adept at placing nuts before learning cams lest you develop bad habits and use the simplicity of active protection as a crutch, thereby inhibiting skill development. There are a number of options available but there aren't many criteria to look for as most are similar. Some prefer an offset nut citing its versatility and placement strength, others prefer a traditional cut. You need one complete set of nuts. I like the Wild Country Rocks. Depending on your area, you may find a need for micro nuts. These small stoppers are occasionally the only thing stopping you from a vicious whipper and you'll be had you had them at the crux. Black Diamond Micro Stoppers are great. While not essential, you may find them useful so add them to your rack two at a time as needed. Note that they do not handle falls the same way regular nuts do so be sure to read the manufacturers specifications. Bring along a nut tool to unseat and retrieve your protection. There are about twelve varieties on the market and they're all basically the same. Any will do. Rack four to six nuts on a separate carabiner organized by size. Active protection consists primarily of spring loaded camming devices (SLCD), which consist of 3 or 4 lobes of soft metal which retract when a trigger is pulled and expend when released or a downwards pressure is applied. These compromise the bulk of the modern trad climbers rack and for good reason. They're simple, reliable and versatile. It appears that the comparative industry standard for cams is the Black Diamond Camelot C4. Many other climbers will compare beta or describe protection requirements based on the protection ranges offered by the C4 ("That crack looks like a #2"). There are many comparables or substitutes available including DMM Dragons and Metolius Mastercams. Many experienced climbers have their personal preferences crafted through experience and availability but if you don't have one yourself, I recommend going with the industry standard. It's just easier. Many people prefer to use small or micro cams in lieu of large nuts but become proficient with passive pro first. Small cams must be able to place easily, quickly and often resist the stress of being placed over an edge. The Black Diamond Camelot X4 fits this bill well. By placing the cables within a protected sheath it is more durable the C4. The larger sizes are identical to the C4 in range and colour so if your budget permits you may wish to splurge. For Ontario, begin with six(6) Black Diamond Camelot C4's in sizes #0.4, #0.5, #0.75, #1, #2 and #3. As finances permit, gradually begin doubling up on the middle sizes, working your way out. Your next purchase should be doubles in sizes #0.5, #0.75 and #1 and consider acquiring #0.2, #0.3 and #0.4. in the smaller X4's. Rack them separately on Black Diamond Neutrino carabiners. The Rack Pack provides six biners of corresponding colours designed specifically for this reason. They're lightweight, cheap and look good. 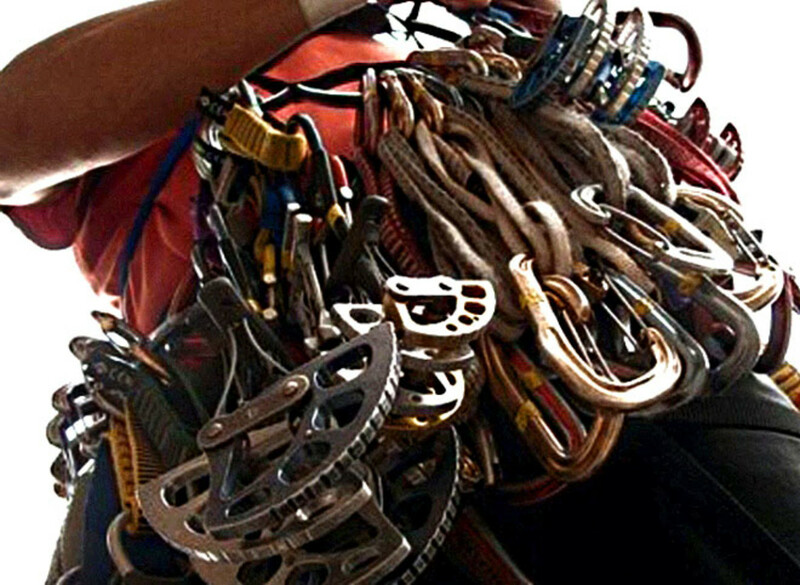 Active and passive protection will make up the foundation of any climbers trad rack. But what makes Ontario (and the nearby Gunks of New York) unique is the high prevalencey of slabby horizontal cracks. While they make excellent handholds they can be difficult to protect. The smooth parallel sided cracks make nut placement occasionally impossible, causing us to instictivly reach for a cam. But the direction of force often weights the cam lobs awkwardly, potentially leading to a blow out on a mid length fall. Additionally, the stem of a cam is forced to lay over the edge of the crack which can cause stresses resulting in a premature retiring of an expensive piece of pro. The solutions for this problem are borderline archaic: Hexes and Tricams. Hexes were amongst the first evolutions in the protection game. The six sided choking device with an offset stem provides a natural camming action when properly placed. While recent changes in the specifics have made them quite capable they remain relatively unchanged since their inception. Most modern climbers turn their noses up at hexes, particularly when their tell-tale cow bell clanking is heard from a mile away, in lieu of cams but they remain useful. For offset cracks or odd placements they are worth their weight (which, coincidentally, isn't much). They offer a wide variety of both active and passive placement options and you won't feel as bad bailing off a $14 hex as you would off a $70 cam. Black Diamond Hexcentrics and Wild Country Rockcentrics are the main options in this space, with the only substantial difference being that one is slung on wires and the other on webbing. Opt for the webbing-slung Rockcentrics as the flexibility may eliminate the need for a quickdraw to prevent walking. Also, with a little creativity you can use a Rockcentric as an additional running if your rack is running low at the end of a pitch. 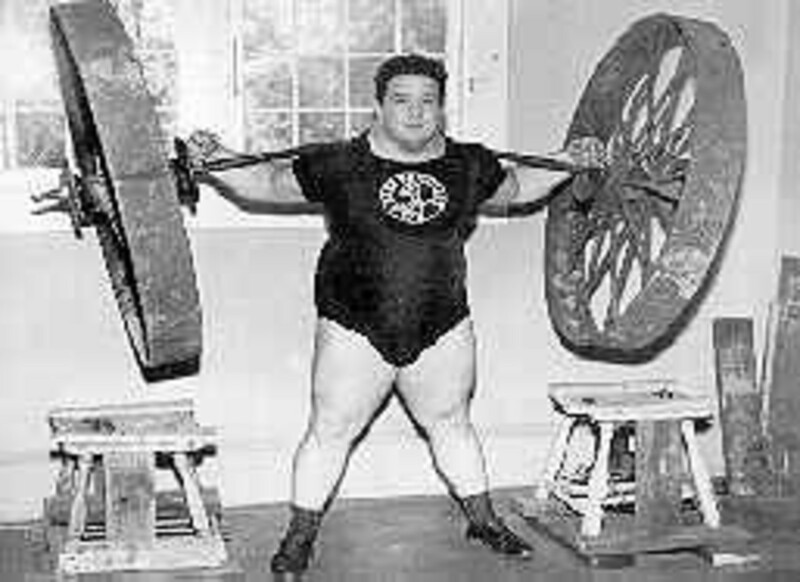 Start with the larger sizes and, if you're using them enough, work your way out. Get Wild Country Rockcentrics in sizes #6, #7 and #8. Don't bother with the smaller sizes as they overlap with the large sizes of nuts. Rack them together or separately. Note that the colours match up with Black Diamond Camelots for size ranges so you can coordinate a really attractive rack if you put each one on a corresponding Black Diamond Neutrino carabiner. Tricams are a relatively niche product and climbers either love them or hate them. They consist of the separate lobes (hence tri) slung on a piece of webbing and provide both active and passive protection. They can be slotted just like a nut or folded over on itself to allow the webbing to slide within the groove between lobs to provide a powerful camming action when loaded. You won't see these often outside of Ontario or New York or perhaps in the back of a season veterans closet but for horizontal cracks or pin scars they are bomber. I frequently place them as my first piece when leading as the camming action can prevent pulls from both the top and bottom, adding further protection for my belay. In crumbly rock you may be able to place a tricam deeper than you'd be willing to risk a cam to ensure it bites into solid rock. Note, if a well placed tricam takes a fall, your second will curse your name trying to retrieve it. The most useful sizes are smaller with the pink being the most popular. Purchase the pink, red and brown sizes and rack them together on their own carabiner. As this is not meant to be a tutorial on how to trad climb, I will assume readers understand the importance of reducing rope drag while trad climbing. Ontario rocks are no different than else where, with a wide variety of straight forward pitches and wandering slab routes. A typical set up here will suffice so I will list my personal set up. Used mostly for sport climbs, they have a lot of functionality in trad. Use them for clipping into nuts and other protection to prevent unseating. Take six to ten depending on the route and any brand or style will do. 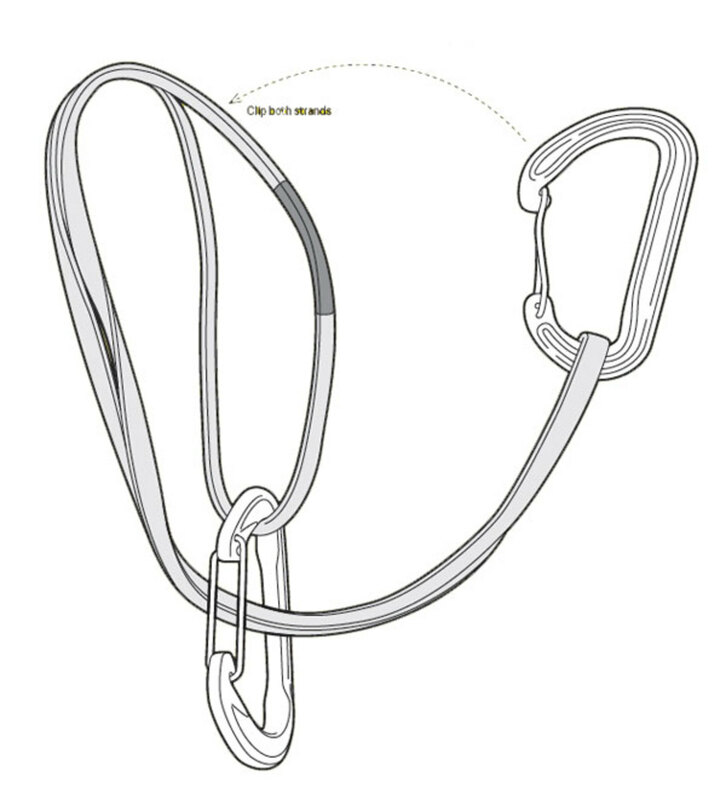 An alpine draw is two carabiners on a shoulder length runner folded over on itself to cut the length in half for racking. They can be extended to keep the rope tracking straight. Bring about six. A shoulder length runner is a sewn sling of webbing about one arms length long. Use these to clip to a piece of protection that already has a carabiner attached, like a cam that was racked on its own biner. Take four to six and sling them over your shoulder. 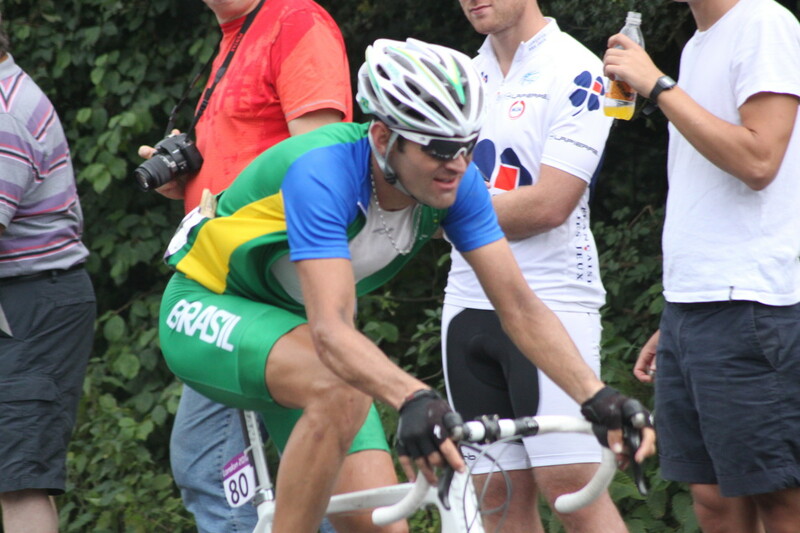 A double shoulder is twice the length of a single. These can be used for large changes in rope direction such as transitioning to an overhang or for creating belay station anchors. Bring one or two. Cordelette is special rope used for anchor building. There are usually ample locations to build direct anchors at Ontario crags so 7m of 6mm cordellete should suffice. Rack it on a locking carabiner. As always, bring a belay device on a locking carabiner, a few extra lockers and a few free non-lockers. I did not include any prussic cord, ascenders or self rescue devices deliberately, as that is a separate article on its own. It should go without saying that you're wearing a helmet and bringing a harness, chalk bag and shoes. Climbers will vehemently argue that there is no perfect trad rack and it will widely vary based on the specific climb and this is true. Many will have personal preferences based on style that will influence their suggestions. 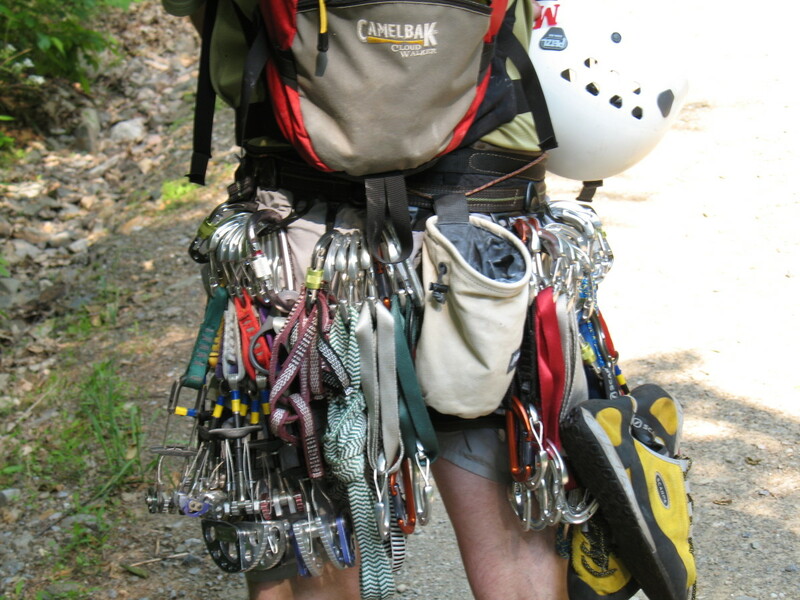 Some (see also: most) are addicted to gear acquisition and insist that you need 40lbs worth of hardware for single pitching at your local crag. Others, the minimalists will tell you that a handful of nuts and some knotted webbing will suffice for a multi day epic up El Cap. Use this guide as a starting point and consult climbers in the area you will be doing the vast majority of your climbing to find out what is required. And if take note of what pieces are frequently missing when you need them most. Those would be wise to double (or triple) up on. This is an expensive activity to embark upon and you don't need to make it worse for yourself by becoming a gear hoarder. Most importantly, seek professional instruction. Climb with experienced climbers in your area and take note of how they're placing their gear and which pieces are used, yet remain forever weary that no one has all the answers. I hope this has been thought provoking and informative. Have fun and be safe. A product review of the Petzl Vasek Leverlock Crampon by Kurt Morrison. What style of rock climbing do you participate in most often? The purpose of my reviews is to offer the reading audience an objective opinion, so they can make an informed decision before buying. All my reviews, opinions, and everything expressed here are my own and based on my experience with a product. I am not affiliated with any of the brands mentioned on my blog nor do I endorse them and they do not endorse me. I am not paid for my reviews. Occasionally, I am provided free products for review, in which case I will make that abundantly clear. Anything discussed on this site is expressed as my own opinion and I reserve the right to my own opinion when discussing my experiences, products, or anything else. Mountaineering and rock climbing are inherently dangerous. Any information provided is for informational purposes only and should not be used as a replacement for advice by a trained professional. Please ensure you're climbing within your skill level and receive appropriate training before embarking on any potentially dangerous activities.